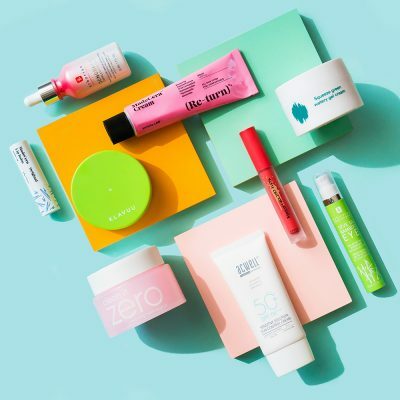 In our sunscreen by skin concern guide, you’ll find the right products with the right consistencies and ingredients for everything from acne to pigmentation. 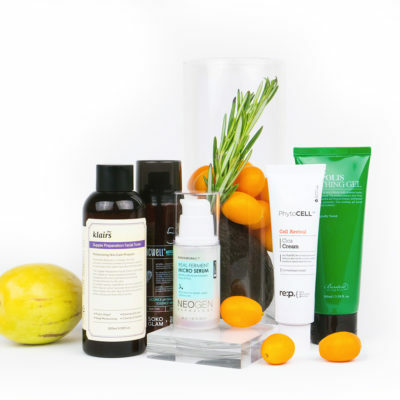 Sunscreen is arguably the most crucial step in any skin care routine, Korean or not. You can have the most intricate, well-thought-out, researched skin care routine in history and it can still all be for naught if you’re not protecting your skin from the sun. Sunscreen protects against the sun’s ultraviolet rays. Scientific evidence shows that using sunscreen, keeping out of direct sunlight, and wearing protective clothing can be effective in preventing skin cancer as well as short term and long term damage to the skin. During peak hours, when the sun is at its most powerful (between 10am and 3pm), it’s better to stay inside or in the shade if you can, to make sure your skin is protected from those harmful rays. But I have darker skin, so I don’t need it right? Wrong. Everyone is susceptible to skin cancer regardless of race, gender, or age. If you’re going outside, you should be wearing sunscreen (even on cloudy days, because up to 80 percent of the sun’s UV rays can still reach through to the skin). You should be wearing sunscreen, particularly around snow, sand, and water which can all reflect the sun’s rays. Anywhere that won’t be covered by clothes should be covered with sunscreen (don’t forget the lips and ears). And sunscreen should be applied at least 15 minutes before going outside and reapplied approximately every two hours and after swimming or sweating. But what do all those terms mean…? SPF stands for sun protection factor and indicates a relative amount of time that your skin will be protected from UV (ultraviolet) B rays. UVB rays are the primary cause of sunburn and reddening on the skin’s outermost layers. By relative we mean this: Say you’re prone to sunburn after five minutes without sunscreen; applying an SPF 15 sunscreen would protect you for 15 x five minutes of 60 minutes, in theory. Dermatologists recommend that you choose a sunscreen with at least SPF 30, which blocks 97% of UVB rays. Higher SPF sunscreens will block a higher percentage, but no sunscreen will block 100% of these rays. Also keep in mind that even though SPF should in theory correspond to how long before reapplication, the American Academy of Dermatologists, recommends still reapplying sunscreen every two hours. PA means Protection Grade of UVA rays. The more + signs following a PA, indicate more protection against these rays. UVA rays penetrate past the epidermis (the top layer of skin) and can cause more harmful damage. The PA grade is based on the PPD or Persistent Pigment Darkening system which marks how long it would take the skin to tan. So which sunscreen should I be using… ? There’s a huge misconception when it comes to acne and sunscreen which is that sunscreen is pore-clogging and greasy thereby causing more acne. And that the sun dries out pimples so if acne is your biggest concern then you should skin sunscreen altogether. Bad idea. Definitely don’t skip the sunscreen. Infrared light from the sun has actually been known to inflame and irritate existing acne. UV rays also stimulate melanin production in the skin, meaning that dark spots and scars can actually become darker from exposure to the sun. Instead of skipping protection, opt for something like the Dr. Oracle A-Thera Sunblock SPF 50/PA++++. This sunscreen is directly from Dr. Oracle’s acne care line. Its lightweight gel formulation seeps easily into the skin, leaving you with a matte finish so there’s no excess oil sitting on your skin. 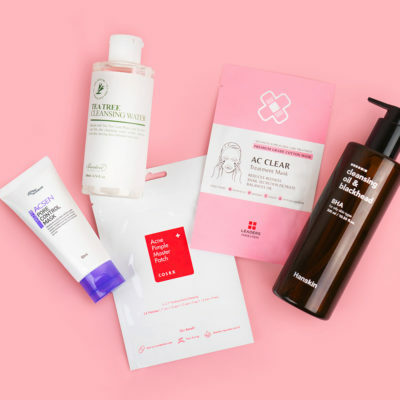 Plus, it also contains centella asiatica, an ingredient famed for calming inflammation and redness, and bamboo water to keep the skin hydrated and balanced, so that you’re not sacrificing sun protection in fighting off your acne. You’re in luck. The best way to protect your skin against premature aging is sunscreen. And pretty much any sunscreen with an SPF above 30 will do, as long as you’re diligent about application. 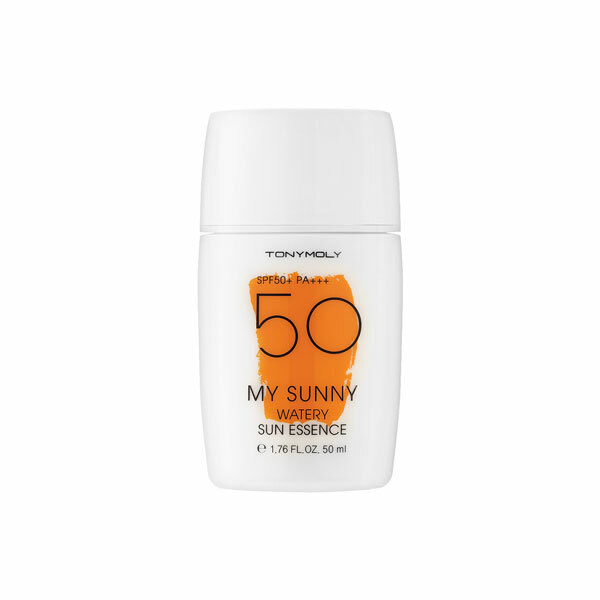 We love the TonyMoly My Sunny Watery Essence SPF 50/PA+++. It contains aloe to help soothe and hydrate the skin, without being oily or greasy. 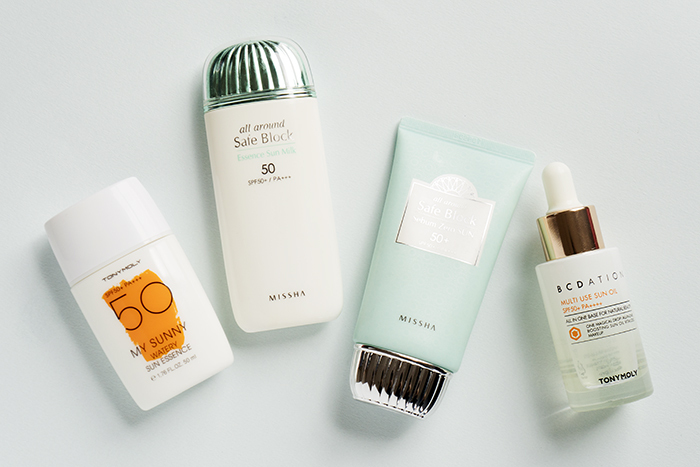 Or opt for the Missha All Around Safe Block Sebum Zero Sun SPF 50+/PA+++ or Missha Mild Essence Sun Milk SPF 50/PA+++, two super lightweight formulations that are still non-greasy and will leave your skin feeling hydrated without that nasty white cast. For a more unique option, you could check out the TonyMoly BCDation Multi Use Sun Oil. This SPF oil can be used as sunscreen, facial oil, makeup base, or hair oil and sinks in easily leaving your skin dewy, soft, and protected. 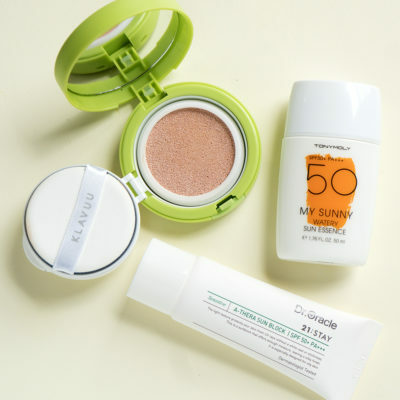 Don’t fret, there are sunscreens for you that won’t clog your pores! 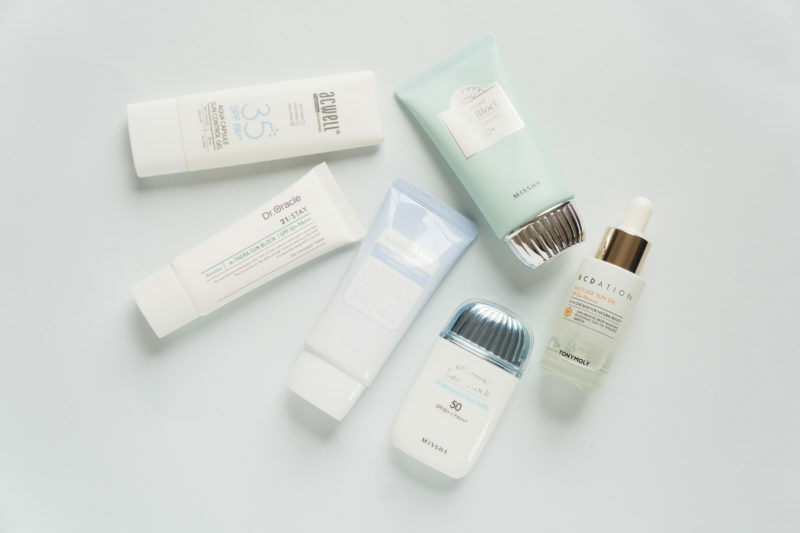 The Acwell Aqua Capsule Sun Control Gel SPF 35/PA++ and Missha All Around Safe Block Sebum Zero Sun SPF 50+/PA+++ are stellar options! The Acwell sunscreen is formulated for oily skin. It’s a super light gel that sinks easily into the skin, calming along the way with peony and mint extracts. Meanwhile the Missha sunscreen is lightweight and water and sweat resistant without being greasy or having an unpleasant fragrance. 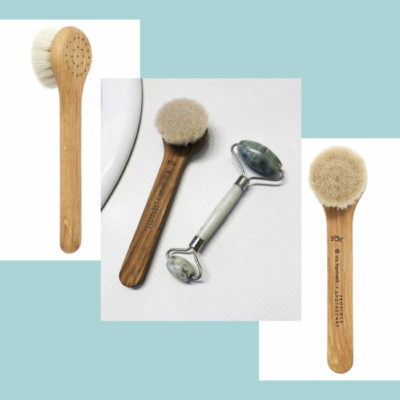 It calms with green tea and tea tree extract as well as controls oil production and has a matte finish. Both will help tame those pores and still keep your skin smooth, calm, and protect all day! Putting anything oily on top of dry skin is the worst. But don’t fret, we know of the perfect sunscreens that will hydrate and moisturize your skin whilst still protecting it from the sun, so you don’t have to deal with any oily and dry skin woes. The Daily Sun Control Emulsion SPF 50/PA+++ is just as much moisturizer as it is sunscreen. It intensely hydrates whilst protecting your skin from harmful UV rays. It contains licorice extract to nourish and brighten, as well as calm the skin and absorbs in easily, leaving your skin feeling plumped and healthy without feeling heavy. 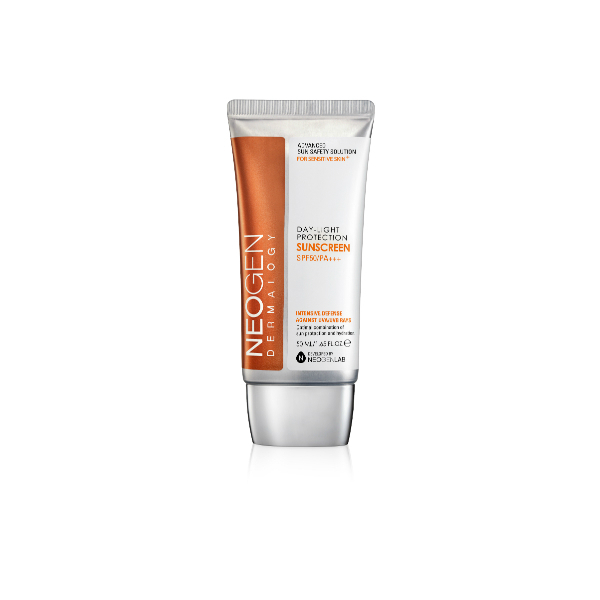 Or opt for the Neogen Day-Light Protection Sun Screen SPF 50/PA+++. A Soko Glam Best of K-Beauty Award winner, this sunscreen is super light and super hydrating, with rose and raspberry extracts for extra hydration on top of your moisturizer. Plus, it has no white cast and no-greasy feeling, so you can feel good putting this on your skin. Then wearing sunscreen is going to be doubly important. The sun’s UV rays can increase melanin production in the skin, meaning they can make any dark spots or pigmentation even darker. The Klairs Mid-Day Blue Sun Lotion SPF 40/PA++ is a tone-up sunscreen. This means that it helps to clarify skin tone, whilst protecting your skin from harmful rays. It’s also formulated with guaiazulene, which helps heal redness, as well as lavender oil and niacinamide to nourish and brighten. Be mindful though. Because this is a tone-up lotion, it will have a slight white cast. 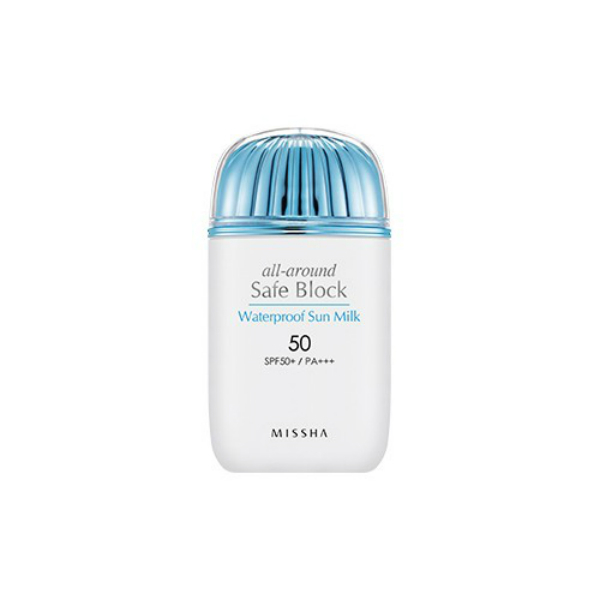 Or opt for the Missha Mild Essence Sun Milk SPF 50/PA+++ or the Missha Waterproof Sun Milk SPF 50+/PA+++. 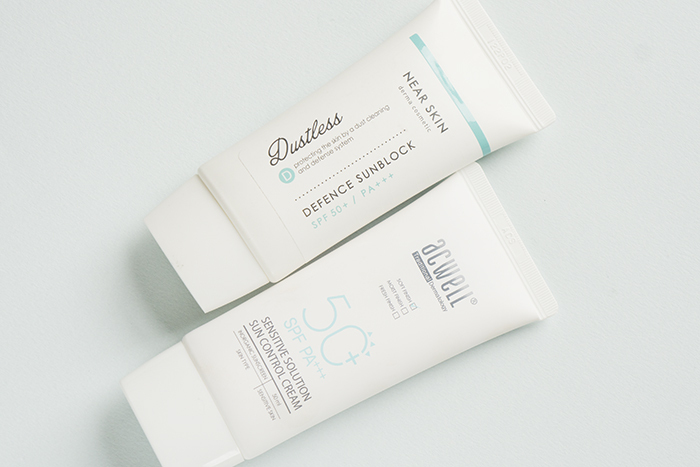 Both these sunscreens will do a great job of protecting your skin against UVA or UVB rays, thereby protecting against further pigmentation without leaving a white cast or layer of grease. If you’re going to be sweating or in water, definitely opt for the waterproof formula for better and longer lasting coverage. Sensitive skin doesn’t excuse you from the sunscreen. In fact, you’ll definitely want to layer up so that you’re making sure the sun isn’t causing any additional irritation to the skin. The Acwell Sensitive Solution Sun Control Cream SPF 50/PA+++ is a great sensitive skin formulation that is gentle and sits light on the skin, whilst still hydrating and protecting against UV rays. Or opt for the Missha Near Skin Dustless Sensitive Solution Sun Control Cream SPF 50+/PA+++. Part of Missha’s sensitive skin line, this sunscreen will protect against pollution and UV rays to make sure there’s nothing outside that’s irritating your skin, including fine dust (hence, the “dustless”)! It’s breathable and hydrating, with no greasy sheen or white cast. If you think you’re not getting enough sunscreen, you’re probably right. This is one of the things where you definitely don’t want to skimp out. Using just your BB cream or foundation definitely isn’t enough. 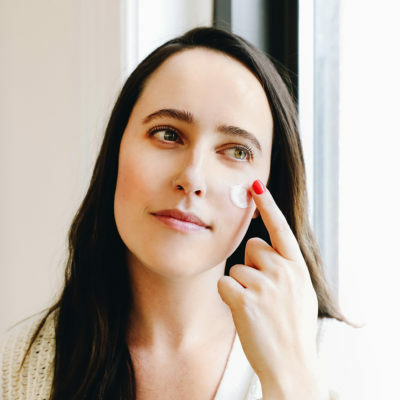 Wearing high SPF can protect your skin against short and long term consequences that are far worse than taking a few extra minutes to apply and reapply sunscreen to the skin. + What do you think of our guide to sunscreen by skin concern? Share your thoughts and recommendations in the comments!